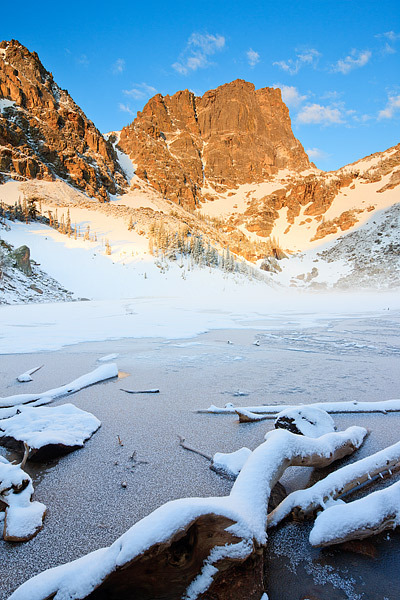 Emerald Lake had been enjoying a mild and pleasant spring thaw. A late May spring snow dumped snow on Hallet Peak and Emerald Lake however, quickly freezing over the surface of Emerald Lake. After the storm, a calm and quiet sunrise greeted Emerald Lake. A slight hint of fog rising from the surface of the lake and some clouds overhead made for a perfect morning. Photo © copyright by Thomas Mangan.